This easy to make, flavorful meal will surprise you at your first bite. Although it may not look too special, the tanginess from the Za’atar (pronounced Zah-tar) combined with a little kick from Aleppo Pepper is unique and refreshing. Using boneless chicken breasts, makes this a super quick weeknight meal that will very quickly become part of your regular dinner rotation. still dealing with 80º+ weather in major anticipation of a cool down. This dish is perfect for the confused weather in action because its very flavorful and comforting, yet light enough to eat when the humidity can make eating a chore. 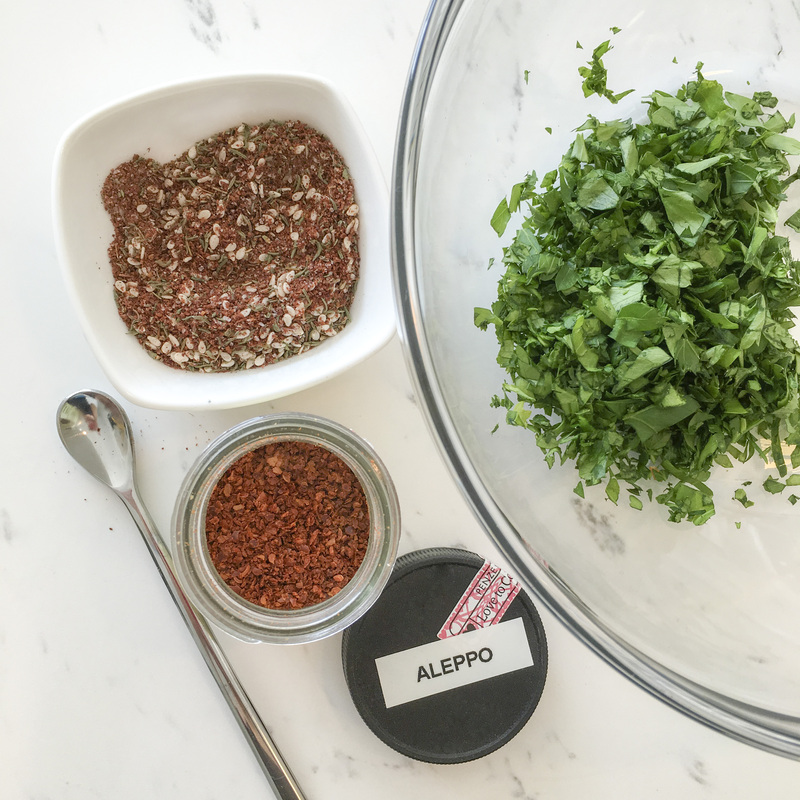 There are some unique ingredients in this recipe such as Za’atar and Aleppo Pepper that may be new to you. For more information on Za’atar, and my addictive recipe for this versatile spice mixture, click here. As for Aleppo Pepper, you are in for a treat! Don’t be intimidated by new ingredients. Take a chance and expand your pantry. A great, inexpensive, and non-committal way of doing that is through spices. Unlike refrigerated items that must be used up pretty quickly after being opened, spices allow you the shelf life to take your time using them up. You can experiment more with them when you have time and not feel the pressure to avoid letting things go to waist. Yes, you can buy a ready made Za’atar spice mix, but you don’t know what you are going to get. Different regions of the Middle East emphasize different ingredients. In mine, I like to play up the tanginess of the sumac, paired with the nutty, buttery taste of the sesame seeds. I downplay the thyme because in my experience it can go bitter if its too much at the forefront of a dry mix. However, I can guarantee that once you make my Za’atar Spice mix, the only thing you’ll be concerned with is running out! Enjoy! *If you don’t have Aleppo pepper you can substitute ground red pepper or cayenne. Slice chicken breasts in half horizontally. Lay between two pieces of plastic wrap and pound to 1/2″ thickness. Set aside. In a small bowl whisk together tahini, lemon juice, and next 3 ingredients (through Aleppo pepper). Set aside and keep at room temperature. If you haven’t made the za’atar mix yet, do that now. Then, in a small bowl combine the parsley, 2 tbsp. of za’atar mix, and next 4 ingredients (through lemon juice). Using your hand, smear this mixture on both sides of each chicken breast. Heat a non-stick pan over medium heat. Cook the chicken for 2 -3 minutes, or until browned. Then flip and cook until finished, about 1-3 more minutes. Drizzle with Tahini Sauce and serve with my Light Tabouli Style Pilaf!